The Swan's Road by Garth Pettersen Book #1 in a series called The Atheling Chronicles, published by Tirgearr Publishing in 2017. I recieved a free copy of this book from the author. I was not paid to write this review. All opinions good or bad are my own. 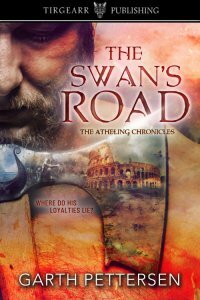 The plot in brief: The Swan's Road is the story of Harold, son of King Canute of England and Denmark. After securing his hold on England, Canute travels to Rome to attend the coronation of Conrad, Holy Roman Emperor. He is accompanied by his son Prince Harold. Their journey follows the Rhine River and at one point Harold rescues a damsel in distress, Selia, and he becomes separated from his father and his retinue. Canute, concerned for his son's safety sends Harold's friends to look for him. Together this group makes its way along the Rhine, and over the Alps, eventually arriving in Rome where they must foil a plot to kill King Canute. Along the way they meet various rouges and like minded wanderers. The book reads like a Three Musketeers meets Robin Hood and his Merry Men. The good guys are good, they bad guys are bad. All that is missing are white and black hats. The women are beautiful, feisty, and can fight like a man when needed. Various 'providential' meetings occur throughout the book which aid the travelers in their most dire moments. No coincidence is too unlikely and the result is a predictable ending. Which I won't spoil for you. The Characters: Harold and his band of friends are one dimensional, they are the good guys. Harold can be a little moody and at times jealous, but he is loyal to his lady. Selia is a strong, defiant woman with her own ideas about who she should marry. She is brave, inventive and a born leader. Their enemy is Duke Robert of Normandy and he is a very bad man, who surrounds himself with other knaves and blackguards. King Canute is one of the good guys, of course. Harold collects friends along the way, instantly recognizing the good in his potential friends. The History: Pettersen has done his research and has a firm grasp on the history and terminology of the era. But the setting of the story is a superficial one. The 11th century was a dirty gritty place full of pain and suffering. Pettersen glosses over the ugliness as Harold encounters happy serfs, jovial inn keepers serving laughing customers. Everywhere he goes, Harold manages to speak or understand the language, despite the fact that Europe was awash with regional dialects. The Writing: For a story about youthful abandon and high adventure the writing is heavy, formal and pedantic. I felt like I was reading my way through a thesaurus. There were times when I felt his use of archaic words ruined the scene. Ex. : waves laving the beach. His use of the dialogue tag, 'said I' drove me to distraction. I often had to stop and reread sentences to decipher his meaning. In conclusion: If you are looking for a rollicking adventure this is the book for you. Aside from the stiff language it's a predictable fun read. If you are interested in Viking/Anglo Saxons I would also recommend Bernard Cornwell's Anglo Saxon Series called The Saxon Tales of which I believe there are now eleven. 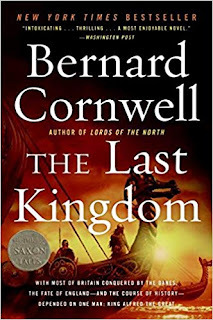 Below is the first one called The Last Kingdom. I read it several years ago and it is very good. I have not read all eleven!